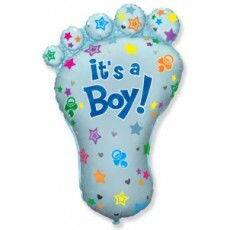 Jumbo Baby Foot Boy Balloon Shape, available loose or individually packaged - Please select packaged option if required. Ideal for New Baby, Baby Shower and Gender Reveal Parties! For filling with Helium (balloon gas), or may be air-filled and used with a Maxi II cup & Stick. Balloons comply with UK and EU Toy Safety Regulations, featuring CE Marking, Manufacturer's details and product safety warnings as appropriate. 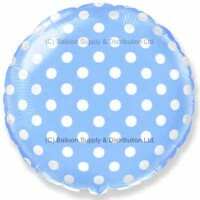 18" Pastel Blue Polka Dot Balloon. For filling with Helium (balloon gas), o..